First things first, an apology! My, it’s been a crazy (crazy good!) week and a bit traveling around London, the countryside of England and now, drumroll please…LISBON! Each day has been spent exploring to the fullest (we can’t help it, there’s so much daylight left at 9pm — it’s crazy! ), but I didn’t intend for my posting here on the blog to become as sporadic as it has been. Normal programming will be returning on Monday — be sure to tune in, I’m sharing more details about this swoon-worthy gold gown I wore here. Secondly, THIS DRESS. 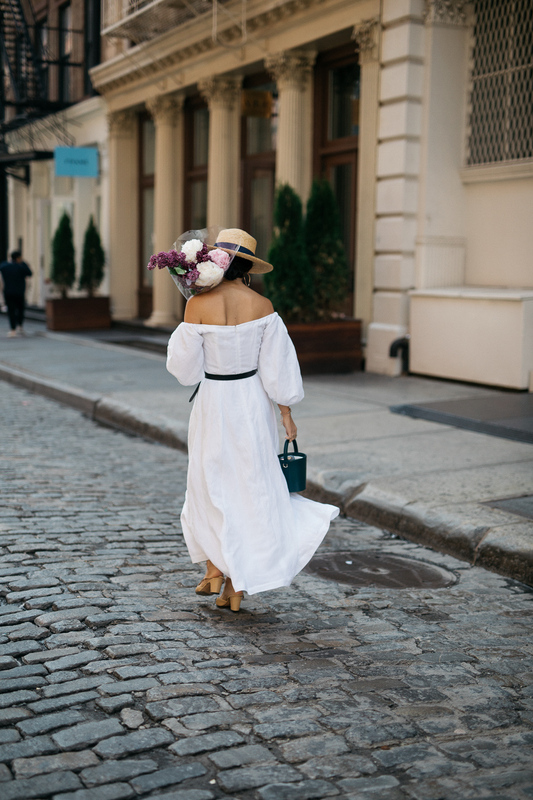 Every summer, a new little white dress rolls into my life that quickly becomes my closet MVP. I suddenly want to pack her for every trip, occasion and oftentimes, for no occasion at all, because I just somehow feel better, more like myself with her on. This Mara Hoffman dress, ladies and gentlemen, is my summer of 2018 white dress muse. There’s something so provincial about it — the princess neckline, the puffed sleeves that can be worn both on or off the shoulders and don’t get me started on the buttons going down the front. I’ve realized my deal breaker for summer dresses right now are design detail buttons. Give me buttons and I’m a goner. 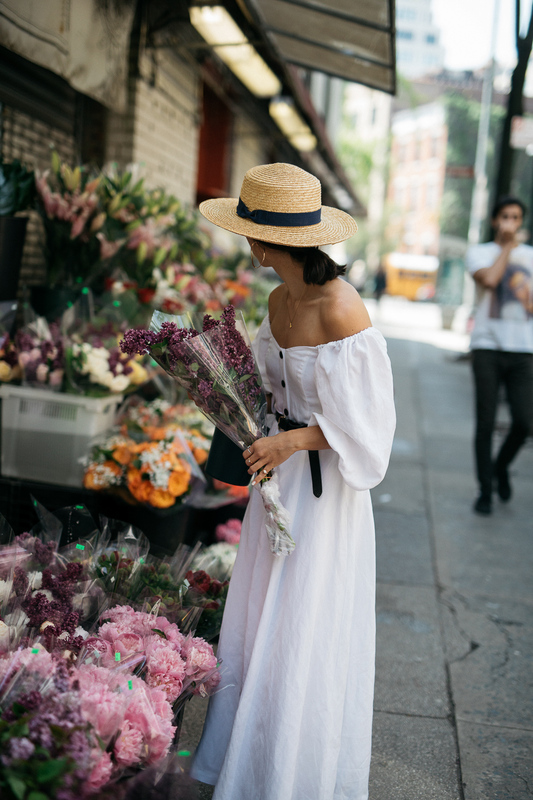 Every time I slip this dress on, it really only feels fitting to find the nearest flower market and bask in the sunshine — if I can’t live in Provence, I might as well bring a sliver of it to me right here in New York if I can, right? Seeing as how I’ve packed it for my current trip and have already received numerous DMs about it, I figured I’d share a slew of my favorite white summer dresses at the moment. Because you never know when a sunshine filled field of flowers may be calling your name and you may as well be prepared for it. As for size reference, I ordered a size 2 in this Mara Hoffman dress — it fits just fine without the belt here, but I do love how the belt cinches me a tiny bit more. Style and friday favorites, mara hoffman, spring style, white dresses. Your white dress is a dream! I hope you’re having the best time in Lisbon! Such a beautiful and dreamy photos! Gorgeous dress! Mara Hoffman has the best pieces for spring and summer.